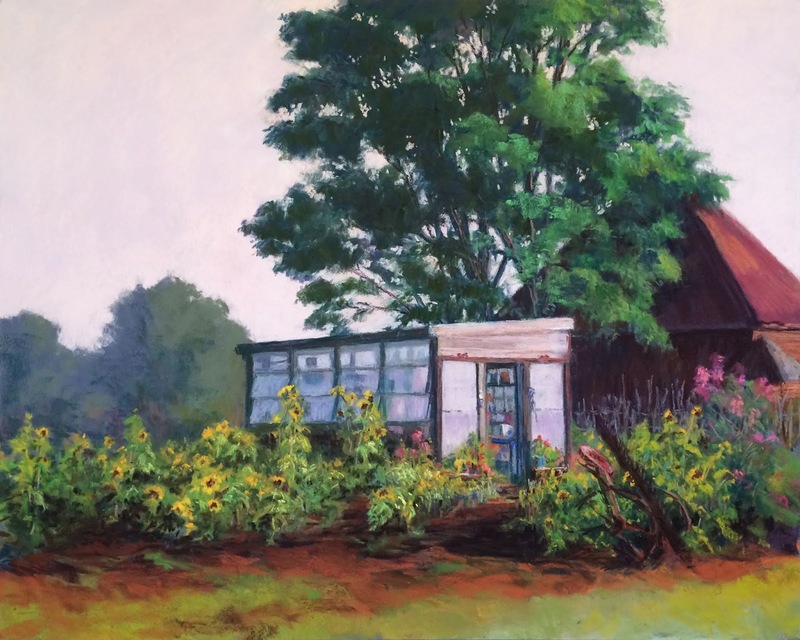 Painting My World: NEW Workshop Opportunity this May in Blue Ridge Georgia! 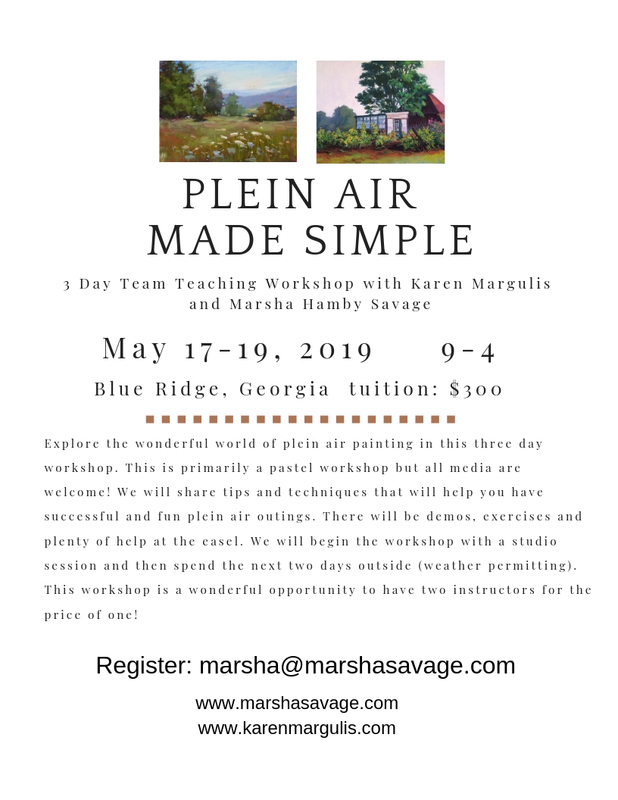 NEW Workshop Opportunity this May in Blue Ridge Georgia! Many of you have asked if I was going to add another workshop to my 2019 schedule so I want to share an opportunity that just came up! I will be doing another team workshop with my good friend and fabulous artist and instructor, Marsha Savage. 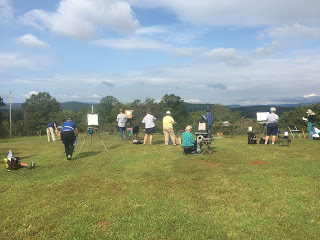 This is a great opportunity to paint in a beautiful place with two instructors for the price of one! We always have a great time. Let me know if you have any questions......Read on for the details! The workshop base location is the Savage cabin and is located on 1 1⁄2 acres on the Toccoa River about 7 miles from downtown Blue Ridge, GA. There is a barn with lean-to, stacks of wood for burning, a pump house, muscadine vines, a few pieces of farm equipment, wagon wheels, a deck just over the river, pavilion with table and wooden swings, old-time painted metal glider and chairs, trees, bushes, flowers, etc. and a dirt/gravel road that winds through the property. Plenty of stuff to paint. It is an old cabin and unique. Some of our neighbors just a few doors down allow us to paint on their property also, with view of the bend in the river and some rock groups in the water... a beautiful area. You can fly into the Atlanta airport and it is about 2 1⁄2 hours to Blue Ridge GA, or maybe Chattanooga TN and not sure of exact amount of time but probably close to the same as Atlanta. You would need to rent a vehicle to drive to Blue Ridge GA. A map will be given to each student after registration. Pricing for workshops does not include accommodations and food. A variety of accommodations are offered in the area, everything from camping, rental of cabins, motels, air-bnb, etc. When workshop participants register, a more formal list of the specific options in the area is emailed. An on-line search can be done to bring up way more than we can provide. 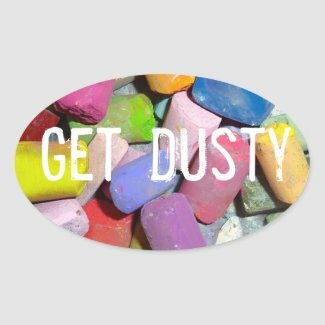 Artist should pick up lunches from the local grocery store or markets in town and bring them each day. We do have a refrigerator onsite to keep things cold. We have a big number of restaurants in town, and there is a dining guide on-line for the area for evenings after class. We normally schedule a “meet and greet” evening the night before the workshop. That would be Thursday, May 16, and held at the cabin on N. Toccoa River Rd. about 7 miles from town - and a beautiful drive. Each day begins around 9 am and we wrap up between 4-5 pm. 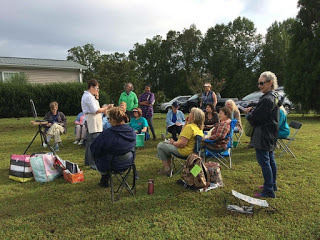 We normally schedule the workshop room at the Blue Ridge Mountains Arts Association (BRMAA) for all three days in case of rain. We have determined the first day should be an indoor studio session for a demo by both instructors, and a short painting time after each of the demos to incorporate some of the ideas and for questions. This workshop is tailored to its participants and therefore no two workshops run with the exact same format. We make decisions depending on the group and the weather, but as an estimate, more than half of the workshop is spent painting. There may be some indoor painting “exercises” but it is all intentional in helping the artist understand more once outdoors. The goal is to help artists be able to answer their own questions and continue their growth beyond the workshop. Artists of all skill levels are welcome to attend. The only requirement requested is that you have experience working with your chosen medium and a strong desire to dedicate yourself to learning and moving outside your comfort zone. A supply list is sent to participants as we near the workshop after registration. These supplies are only recommendations and artists are encouraged to bring supplies of their choosing. The tuition of $300 is due at registration. Marsha is handling registration. Please send her an email here to let her know you wish to register.